The Brio Wall/Pedestal Basin is an incredibly sleek and stylish basin, which will transform any bathroom into an ultra-modern space. It sports an attractive design and can be installed as a wall, pedestal or shroud basin. 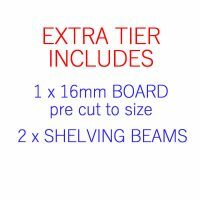 It measures 440x550mm in dimensions and is designed to offer easy installation in any bathroom space. This bathroom basin includes an overflow as standard and comes equipped with wall brackets. Thanks to clever design, the wall brackets are well concealed behind the basin allowing neat and tidy installation. Additionally, it can be accessorised with a pedestal or shroud and can also be converted to 3TH at an additional charge. Accessories are optional extras that need to be purchased separately. 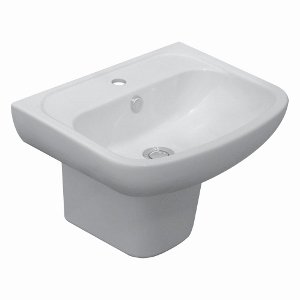 The Brio Wall/Pedestal Basin is a superior grade product made from top quality vitreous china. It is a heavy-duty bathroom basin which is built to withstand the test of time. Trust the Brio Wall/Pedestal Basin to present the perfect blend of form and function required to transform your bathroom. Don’t delay. Go ahead and buy this stylish and elegant bathroom basin in Perth from our online store and avail of our 14-day money back guarantee.